From high-level business to home relaxation, modern life revolves around data. We all know that sinking feeling of a missing file. Fortunately Disk Drill is here to help with advanced file recovery software on all of your connected devices and files. Download Disk Drill, click “Recover” and watch as your day gets better. Disk Drill is a free download for Windows 7, 8 or 10 (XP and Vista included). Disk Drill offers free data recovery within 500MB. With almost all modern versions of Windows supported, Disk Drill is also available for Mac OS X. Disk Drill is powered by multiple data recovery algorithms that read NTFS, FAT32, EXT, HFS+ and many other file systems. Even obscure file types are accessible using our software. Recover your lost data on system disks and external devices, including all types of memory cards and USB drives. If you can connect it to your computer, Disk Drill can find your lost data. Disk Drill tells you if your files can be recovered for free. Just a few files deleted? 500MB of free data recovery on us! There are countless ways to lose your data. Power failure, failed boot drives, partition damage, an accidentally emptied Recycle Bin, a virus attack… these are only the most common. Data loss can be a frustrating, infuriating or downright terrifying experience. For fast, reliable file recovery software, download Disk Drill for Windows to recover your lost data no matter what the cause. Once installed, Disk Drill scans for lost data and scavenges recoverable files from any accessible media. Hard drives, both internal and external, memory cards, USB drives, music players — Disk Drill can read all of them. Disk Drill can accomplish free file recovery from a wide range of file systems, including NTFS, FAT32, EXT, HFS+. All your lost documents, including music, pictures, videos, documents, custom file formats and much more can be quickly and easily restored. Was your data lost just a few minutes ago? 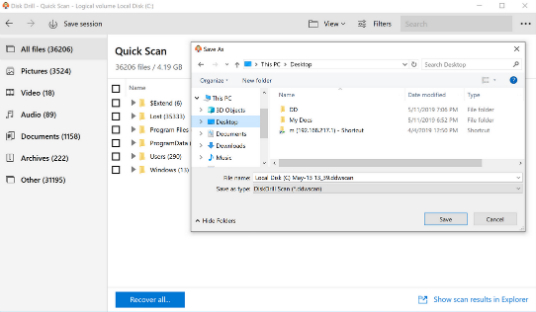 On Windows, your chances of free file recovery are much higher if you act right away and Disk Drill is the perfect way to retrieve these lost bits. Even if Disk Drill wasn’t installed when the files were deleted, Disk Drill knows where to look and can bring them back to you in a flash. Accidentally deleted files are an easy target for Disk Drill’s Quick Scan function. Typically, when a file is deleted, the file contents are still there on the drive and only the filename has been marked as removed. Quick Scan takes just a second to find the list of recently deleted items. You then choose which ones you wish to recover and Disk Drill recovers them as if they’d never been lost! If your loss was a little less recent, Disk Drill free file recovery software can also dig much deeper. 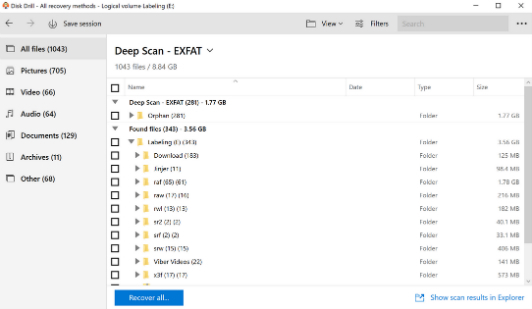 Deep Scan does a thorough search of your entire drive to find and reconstruct lost files. Disk Drill’s Deep Scan feature recognizes more than 350 file types. This list is growing and we gladly accept customer requests for new formats! Disk Drill is a free download for Windows 7, 8, 10. Recovering data from large hard drives or memory cards can be a time consuming process. In an ideal world we would be able to sit around and wait, but that is not always the case, which is why Disk Drill features powerful session management features. Scans can be paused, stopped or resumed anytime. This means that you do not need to wait for a full scan to finish if you have already found the file you were after, simply stop the scan and recover it. If you need to pause a scan to step away or turn off your computer, no problem! Come back and resume a scan anytime exactly where you left off in a prior session. Flexible scanning means Disk Drill understands your data recovery needs! Still, keep in mind, that we recommend you to stop using the storage device with lost data right away after the accidental deletion occurred. 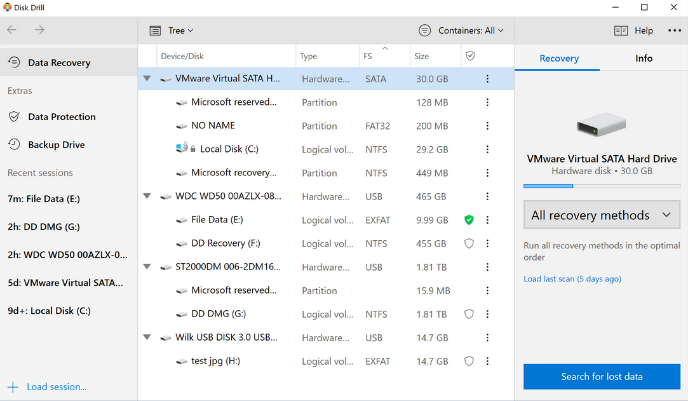 So, while you have the flexibility of managing the recovery at your own speed, the recommended setting will be: stop using the drive, recover or create a recoverable disk image asap. Even before your data is lost, download Disk Drill to start protecting your files right now. With Recovery Vault enabled, our software provides an added level of protection for all your sensitive and important locations. 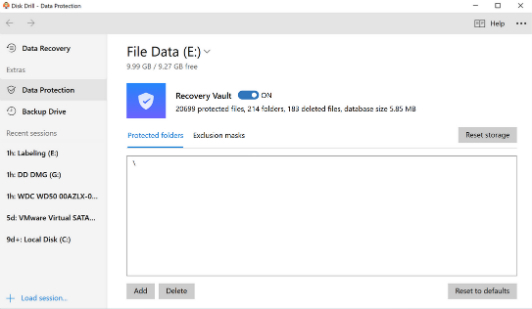 Quite simply, Recovery Vault stores detailed information about every file that you delete, think of it as an extended Recycle Bin in your system without the need for extra disk space. That way, if you change your mind it’s a simple matter of a click to restore it back. Recovery Vault’s detailed database of every file and folder that you delete is the key. Disk Drill is always working and fixes the major flaw of the operating system: even when you hit Delete, all the original file’s meta-data stays intact and it’s only a matter of a few seconds to recover any erased directory or file. Recovery Vault is a complete free data recovery solution: no caps, forever free. These powerful optional features can be enabled or disabled at your own discretion, Disk Drill is a flexible and powerful free download. Disk Drill for Windows is a free data recovery software. Its powerful scanning engine is unmatched in versatility and scanning power. You can recover up to 500MB completely free. Advanced scanning options like Quick Scan for fast, easy scans and Deep Scan for more complex, deeper searches means that your files can easily be recovered by Disk Drill. Recovery goes beyond just files with Disk Drill’s full partition recovery feature. Included with Disk Drill are several powerful partition healing algorithms, too. Combining these tools into a single data recovery suite (Disk Drill) means you have the best possible chance to recover not only your files but your entire storage medium. Disk Drill is especially helpful after erroneous formats on partitions, by scanning the entire drive (and not just the new partition) it is possible for Disk Drill to recover the original partition and many or all associated files. Multiple advanced recovery algorithms including Quick Scan and Deep Scan for more complex situations. The best way to fix lost files is to prevent file loss! Disk Drill’s Recovery Vault protects your valuable files and data. 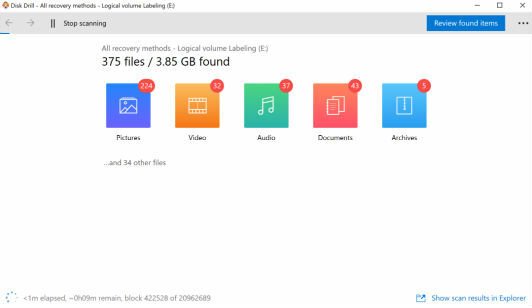 Don’t want to restore multiple files on your computer now? No worries, Disk Drill can backup your recovery results into a mountable DMG or ISO! We know life happens, Disk Drill offers a powerful pause and resume feature to start and stop scanning at anytime, perfect for large drives. Disk Drill can scan and recover from USB drives, memory cards and other forms of portable media. If your computer can read it, we can scan it. Lost or damaged partition? No problem. Disk Drill features an advanced partition recovery tool and several healing algorithms, too.